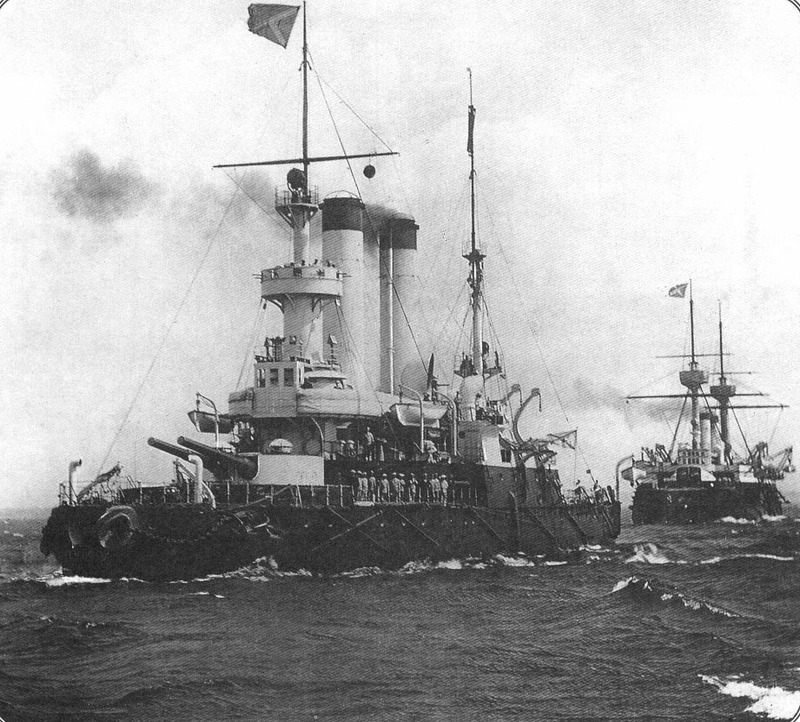 The Admiral Ushakov was laid down in 1892 by New Admiralty, launched in November of 1893, and completed in 1895. 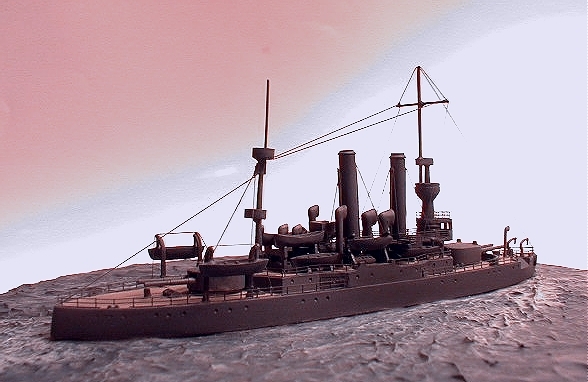 Combrig’s1/700 offering of the 1897 Russian pre-dreadnought Admiral Ushakov is a splendid little kit, and is unique in the respect that it can be an excellent beginner kit, or can be superdetailed for the more advanced modelers. 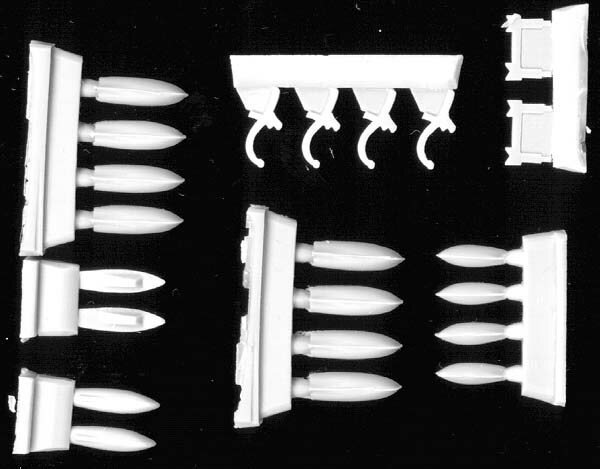 The hull is cast integrally with the 01 deck level , although the instructions showed these parts cast separately. 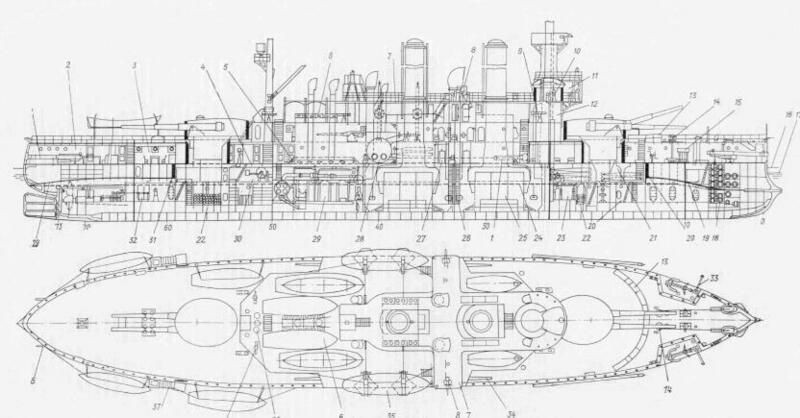 Either way, it’s not tough to align the parts, since the 01 level is flush with the hull at the widest point in the beam. When building this kit, you must determine the level of detail you intend to add, since Combrig decided to mold walls to the bridge wings, and along the 01 level. Plans and the few photos that are available clearly show these were, in fact, 2-bar railings. I removed the ‘walls’ with a pair of Xuron flush cutters, and sanded the areas smooth in preparation for the brass rails. Since there’s no photoetched brass included in the kit, you’ll need to obtain 2-bar and 3-bar rails. The two bar rail has standard stanchion spacing, while the 3-bar rail has the much tighter stanchion spacing used for platforms and small areas. A search through my surplus brass found more than enough 2-bar and 3-bar rails to complete the job. 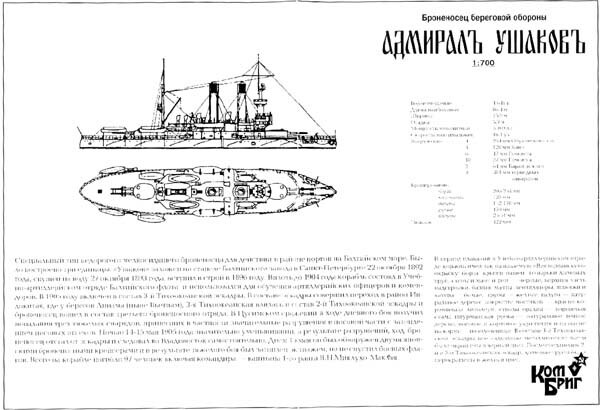 Ushakov is a very small ship by WW2 standards, so you’re not going to need vast amounts of brass to complete the model. I used about 6 inches of 2-bar rail and about 4 inches of 3-bar rail to complete the entire model. 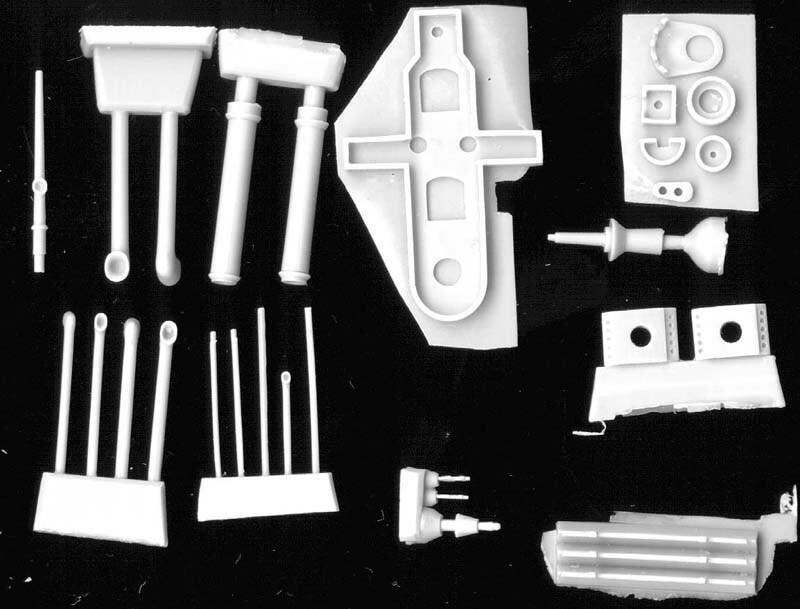 Since I decided I was going to detail the ship as much as possible, I started looking for additional parts to replace some of the kit parts. 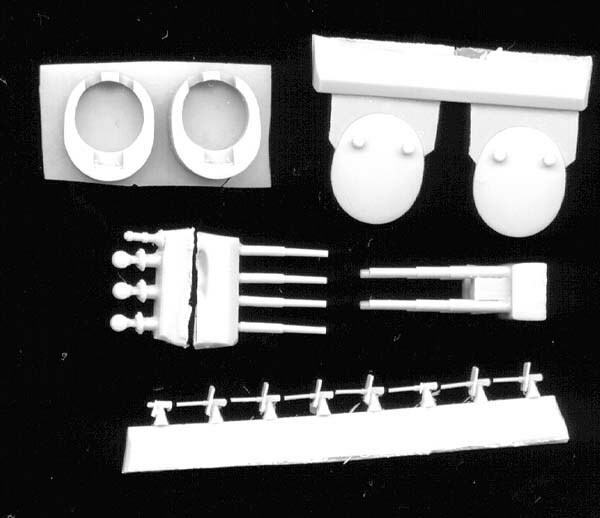 USN and IJN Skywave weapons sets provided lifeboats, and a set of lifeboat davits that matched the kit parts in shape, but were much finer in detail and not as heavy. I replaced the kit’s crow’s nest with a fire control director tub, which matched the shape and height, but wasn’t as clunky as the kit part. 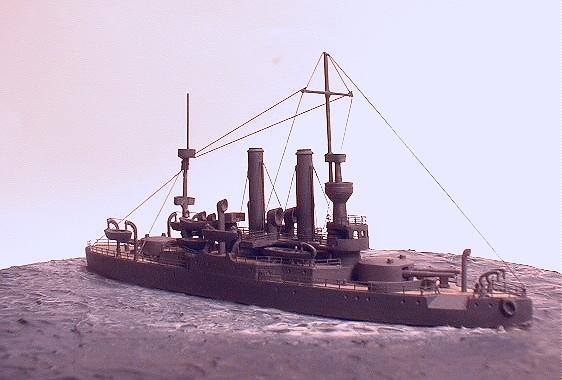 I replaced the masts with brass rod, and have ordered a fret of photo etched anchors from Tom’s Modelworks. 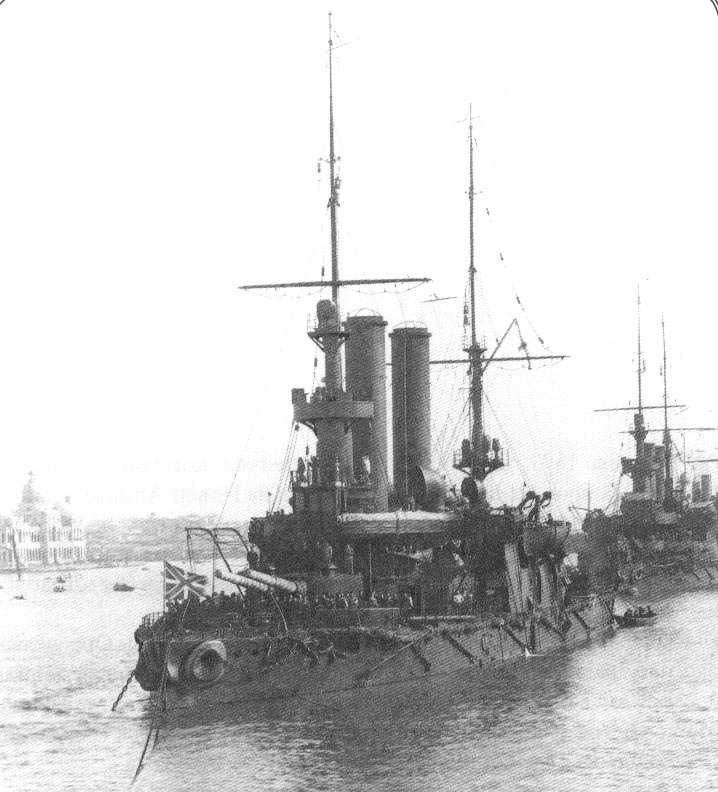 Once I gathered all the additional parts, I starting looking photos of her paint schemes, and settled on the overall gray she wore in the March 1905 picture of her at Port Said, 2 months before her loss at the Battle of Tsushima. I wasn’t sure about her white and black scheme, it had too much contrast for my liking, and the overall light gray of her early career didn’t appeal either. I used a mixture of Tamiya Dark Grey mixed with IJN Light Grey to get the desired effect. The deck was painted with Polly-Scale ‘Old Concrete’, which resembles teak that has been cared for, with a slight hint of grey. Assembly was easy and straightforward, the most difficult part being the rails. 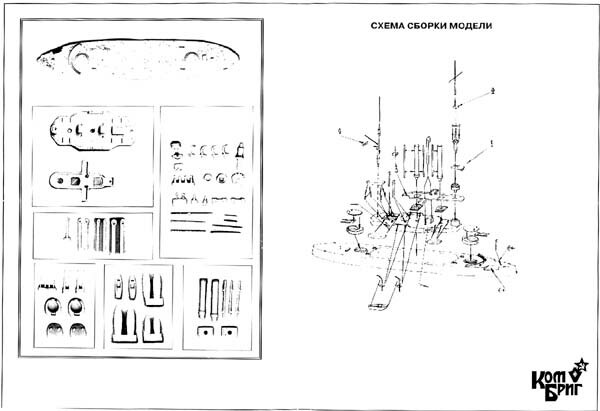 The instructions are in Russian, but the exploded view diagram and the simplicity of the kit make understanding Russian unnecessary. 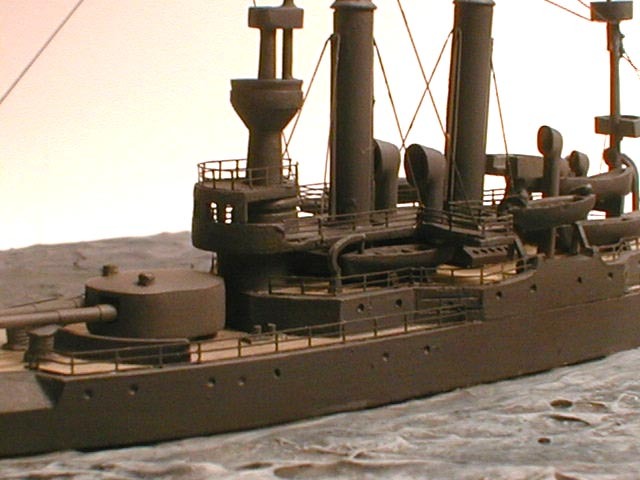 Once the subassemblies were built, I began weathering areas of the ship that would prove tricky later on, around the pilot house, the main deck, and the 01 level once attached. 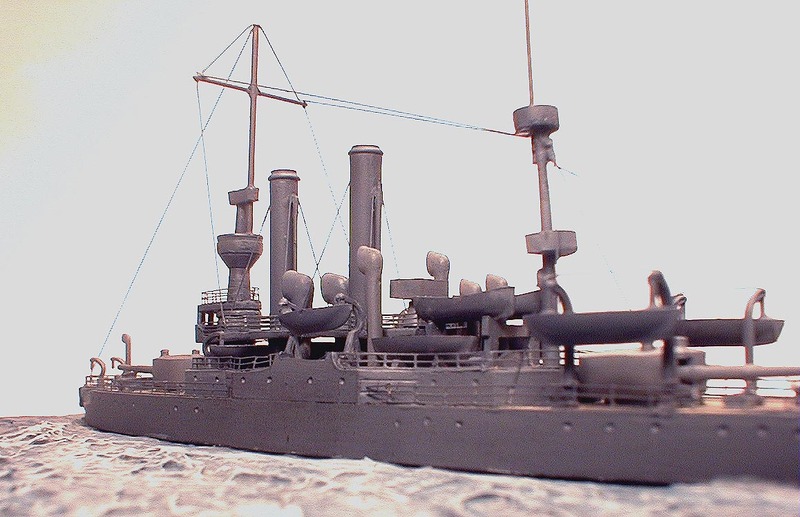 I added the funnels, masts, and lifeboats as per the instructions, then sprayed the entire model with Dullcote. Once dry, I rigged the model with nylon quilting thread, using the line drawings as a reference. The model was attached to a simple wooden base and I used Acrylic Gel Medium to simulate the water. 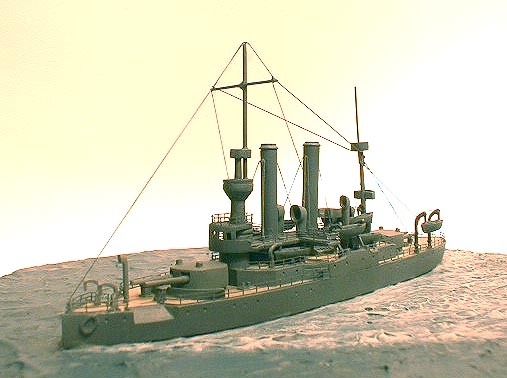 The base was painted with 20-B deck blue, the gel applied, and then drybrushed with 5-N Navy Blue and IJN light gray around the tops of the waves and wake. The kit is simple, straightforward, and fun to build. 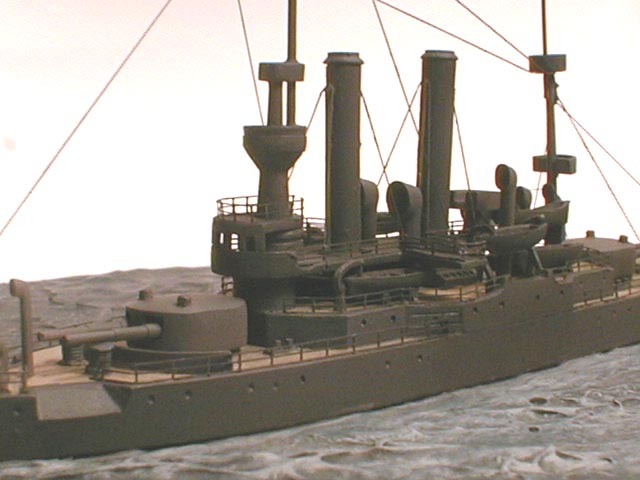 Beginner’s will like the simplicity of the build, and advanced modelers will enjoy the ease of superdetailing the kit. 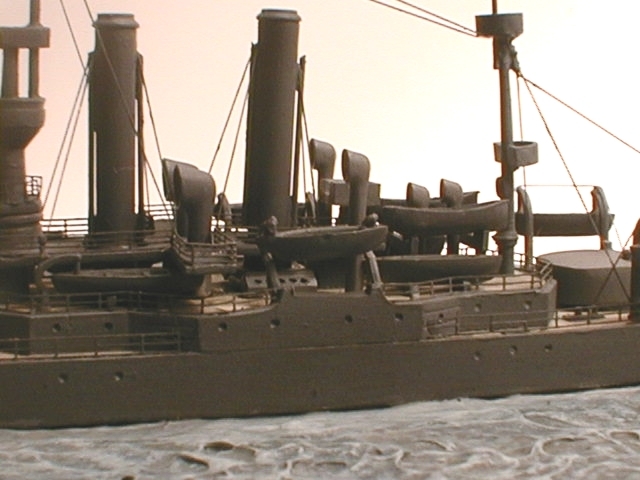 Intermediate and novice modelers will not find the removal of the resin ‘walls’ too difficult, and the ship offers a variety of paint schemes to choose from during her career. 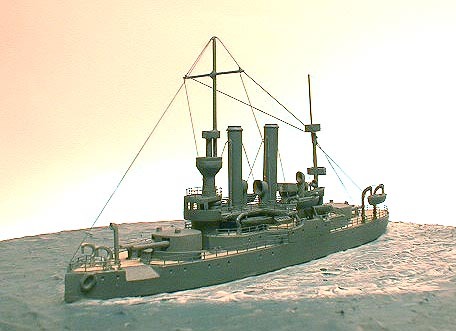 Although I am not a fan of pre-WW1 vessels, this little ship finishes into an attractive model in a relatively short period of time. 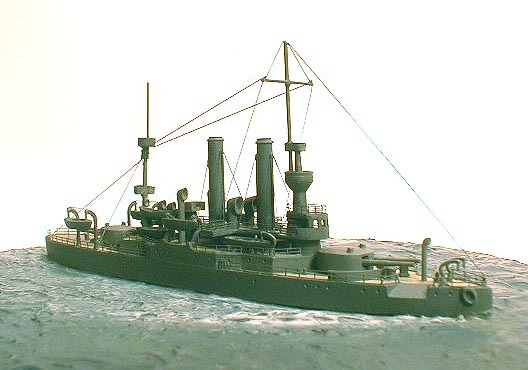 This kit is available from Pacific Front Hobbies and retails for $28.00 US. 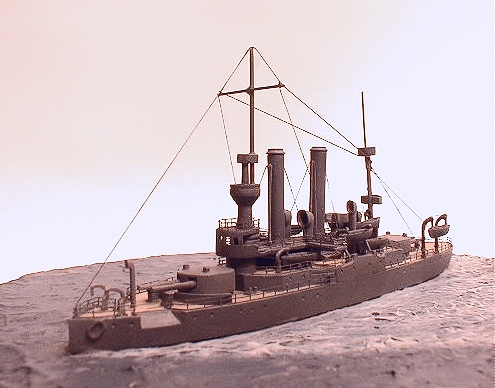 Note: At the time I photographed the model, I was waiting on surgical tubing for the 4.7in secondary armaments, and photoetched anchors. 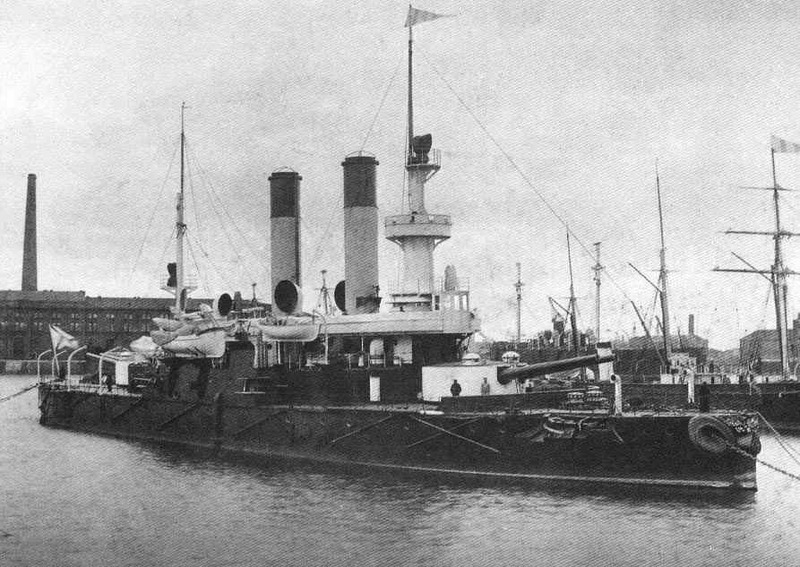 As a result, the barrels and anchors are missing in these photos. Photos were taken with a variety of lighting and filters, none of which I'm overly pleased with.